The excitement is all around and the consensus is in – Burgundy 2012 Reds are going to be great. Speaking from Sunday’s Press Conference Podium at Beaune’s Hotel Dieu, just before the beginning of the 152nd Hospices de Beaune Wine Auction that is at the heart of the Great Bourgogne wine tradition, acknowledgment of the difficult weather conditions of 2012, including three hailstorms, tinged with wonderment the BIVB’s revelation that 2012 is going to be a great year for their reds and a really good year for their whites. The Hospices Auction confirmed their conclusions. The Domaine des Hospices de Beaune offered 31 cuveés of red wine – whose overall sale value saw an increase of 68.85%. They offered 13 cuveés of white wines whose overall value is up 18.11%. 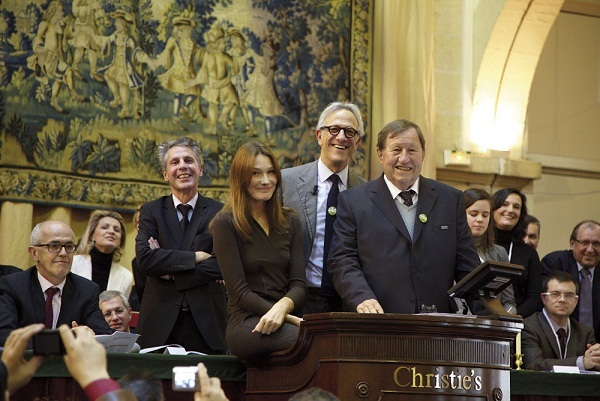 The Auction was presided over by First Lady (former) Carla Bruni-Sarkozy whose foundation is the recipient of the charitable sale proceeds from La Pièce des Présidentsalong with the Fondation Idée, French footballer Guy Roux’s foundation that benefits people suffering from epilepsy. New this year to the auction is the Grand Cru from the Côte de Nuits, Echézeaux Cuvée Jean-Luc Bissey. All six barrels sold for a total of 300K Euros. For La Pièce des Présidents this year it was a “tonneau”of 350 liters of the lovely minerally Grand Cru Corton, Cuvée Charlotte Dumay. *Note about the Whites [Domaine Hospices de Beaune] – While the reds are being heaped with all the praise, the Whites, to this taster’s palate, are rich and exceptionally well-balanced. For such young whites, my inkling is that in a year and onwards these will be superb drinking Burgundy whites. With a good number to cellar as well. 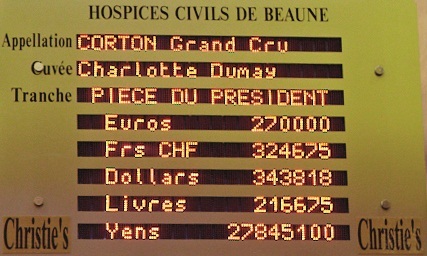 “Many records were broken at the 152nd Hospices de Beaune auction. Star Cuvées amongst the red wines included (with average price per barrel and percentage increase compared to 2011): Clos de la Roche Cuvée Georges Kritter €55,667 (without premium +94.2%) and Mazis-Chambertin Cuvée Madeleine Collignon at €38,318 (without premium +57.7%). Thanks to a recent generous donation, a new Grand Cru from the Côte de Nuits was offered for the first time. This was Echézeaux Cuvée Jean-Luc Bissey, and all six barrels sold for a magnificent €50,000 (hammer price) per barrel, raising €300,000 for the Hospices.